Jemelec designs and manufactures power conversion equipment, including motor generator sets for the power industry. The use of a Jemelec motor generator set for frequency conversion, even when combined with an electronic drive to the motor, is much more robust than a system where the load is directly supplied by the electronics. An induction motor represents such a well-defined load that an electronic drive is highly unlikely to fail due to overload or unexpected load changes or conditions on the generator side. It is this inclusion of the motor-generator that effectively protects the drive and provides a clean supply to the load without the PWM harmonics from a purely electronic solution, whilst still providing the flexibility of variable frequency output. The use of standard off-the-shelf components, coupled with careful design, ensures that repairs and maintenance of Jemelec motor generator sets are quick, straightforward and generally do not require specialist tools. It is this philosophy that has attracted clients such at Brush, ABB, Edwards Vacuum, GE and Scottish Power to name a few. Jemelec motor generators are all manufactured in the UK utilising components sourced from some of the leading European and global motor and alternator manufacturers. This coupled with high attention to detail ensures that the end product is of the highest quality. Jemelec rotary converters offer a rugged and stable source of power at voltages and frequencies not available from the local mains supply, e.g. 25Hz, 50Hz, 60Hz, 100Hz, 120Hz or 400Hz and with output powers ranging from below 2kVA to more than 1MVA. 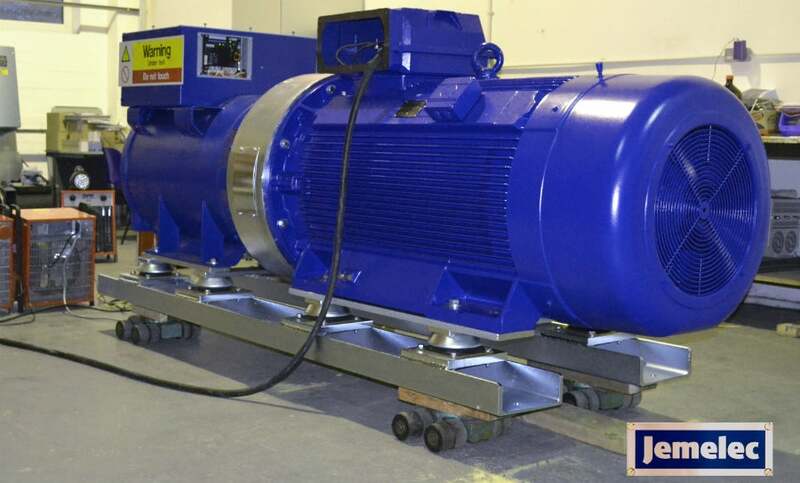 Jemelec employs oversized alternators, where necessary, to provide an ideal solution to kVAR boosting and motor starting where the power factor of the connected load is very low. Jemelec frequency converters are produced to the client’s exact requirements and all common frequencies served. The output waveform is sinusoidal with low-harmonic content and the generator will tolerate large overloads without significant distortion. Adjustable output frequency (normally 45Hz-65Hz) is provided for by incorporating a variable speed drive to the motor and the output voltage can be adjusted on the (automatic Voltage Regulator) of the generator. Jemelec frequency converters provide a convenient source of power at alternative frequencies for manufacturers wishing to prove suitability of their electrical equipment for sale in export markets where the supply frequency differs from their own. A simple and reliable way of stabilising the frequency of a system subject to short duration variations is to introduce additional inertia. Jemelec inertial stabilisers provide this required inertia through the rotating mass of the motor generator set. Inertial stabilisation can also be combined with frequency conversion and kVAR boosting. Partial discharge testing of medium and high-voltage transformers and generators requires a clean supply, often at elevated frequencies. This is readily obtained from a Jemelec motor generator or rotary converter. 100Hz and 120Hz outputs are also suitable for hi-pot testing of line frequency equipment at up to twice rated voltage. Jemelec motor generators offer a cost-effective solution for training generator engineers and technicians on real-world equipment utilising the same AVRs and control systems as utilised on multi-megawatt gas or steam turbine units, but without the risk of damage to such expensive equipment. A basic motor generator set can be supplied for incorporation into the client’s own training system. Complete training rigs, including portable sets in acoustic enclosures for use in the classroom, are also available along with grid and generator instrumentation, synchronisation controls and AVR racks. To complement the wide range of rotating power conversion equipment offered, Jemelec also manufactures single and three-phase, dry type low-voltage transformers and transformer rectifiers up to 50kVA. With more than 15 years of manufacturing experience in this field and products backed by the Jemelec standard two-year warranty and optional five-year warranty, you can be certain that the product will prove to be a solid investment. For further information on any of our products or to request a call back, please fill out the form on this page or contact us directly with your enquiry. Jemelec designs and manufactures power conversion equipment such as motor generators, rotary converters, frequency converters, inertial stabilisers, and transformers. Manda allows power operators to monitor electrical installation from anywhere with a single piece of simple-to-use software. Generator training sets enable technicians and engineers to practice operating and synchronise generators with both the grid and one another safely. Motor generators are used to isolate electrical loads from power supply lines. Jemelec manufactures single and three phase low-voltage, dry-type transformers. They are available open frame or in steel floor or wall mount enclosures. With over ten years experience in power generation and transformation, Jemelec can provide an unparalleled range of motor generator sets for the most diverse range of applications imaginable, from simple frequency conversion to generator training.